College towns that are considered the best in the nation have pedestrianized downtown areas. 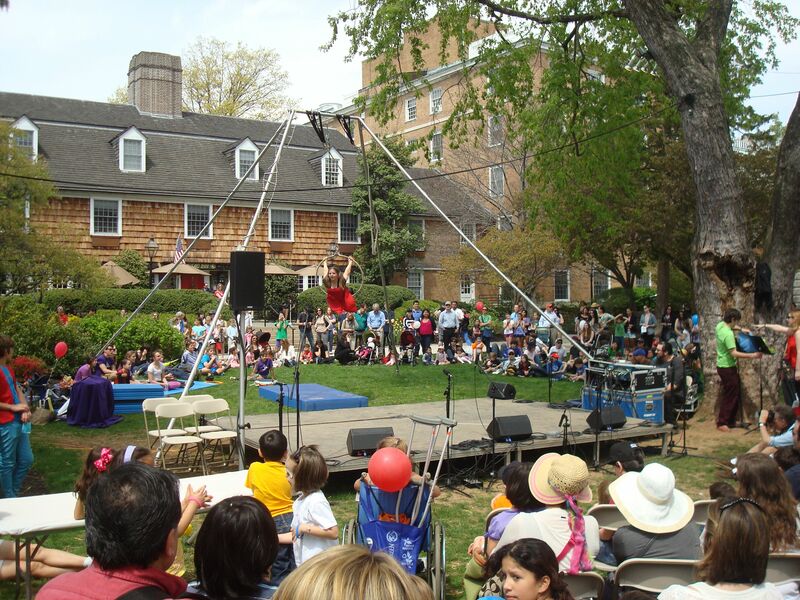 Every summer, Princeton closes streets around Palmer Square for events like Communiversity and Princeton JazzFeast- events that are wildly popular, and bring thousands of people into town. Despite this, for most of the year, a huge amount of space around Palmer Square is given over to on-street parking, encouraging drivers to circle the downtown looking for a convenient park, increasing pedestrian-car conflicts and limiting space available for outdoor dining, art and street performances. This raises the question: why doesn’t Princeton pedestrianize the streets around Palmer Square permanently? And the answer is…it already happened, but Princeton failed to make it stick! He warned that daily car traffic through the town could soon exceed 20,000 vehicles per day, and exhorted Borough and Township planners to take steps to maintain the town’s livable character, including collaborating with nearby towns to establish a permanent Green Belt around Princeton. Considering Mr Agle’s views, it’s not surprising that his 1972 plan proposed what modern-day planners would call ‘putting cars in their place‘. Agle’s plan proposed a Princeton “free of parking meters and on-street parking.” Sidewalks would be widened and land would be planted with extra trees and shrubs. Witherspoon Street would become a pedestrian mall between Nassau Street and Hulfish. And where would the cars go to park? To a network of parking garages, so that they would be hidden away from shoppers. The plan attracted great interest from the public and members of the Central Business District (CBD) community. Nicolas Carnevale, president of the Chamber of Commerce observed, “The Chamber is behind it, and a lot of people are pushing for it”. As part of the planning effort emerging from the Agle report, a proposal was made in 1973 to close streets around Palmer Square to vehicular traffic. Sure enough, on May 5 1973, parts of Palmer Square closed to cars. The backlash came quickly. Letter writers to ‘Town Topics’ complained about the loss of on-street parking, and called the plan ‘foolishness’. Others expressed fear at the idea of groups gathering in Palmer Square, and suggested that true pedestrians walked from one place to another, and would not linger in public plazas. Perhaps in light of this opposition, the Borough made the decision to reopen Palmer Square to traffic in June of 1973. At the time, Borough Mayor Robert Cawley said, “The closing did not create horrendous traffic problems, and traffic isn’t the reason for opening it again.” Instead, he said- presumably referring to the closed portions streets- “there wasn’t any way to make that black asphalt temporarily attractive.” He expressed optimism that a new way of pedestrianizing Palmer Square would come about soon. It never did. Meanwhile the Agle plan encountered increasing objections from area merchants, who worried that deliveries would become too difficult if streets were closed. By 1974, the Central Business District was discussing alternative approaches. The parking garages envisaged by the Agle plan did get built- starting with the parking structure at Chambers Street. But the parking garages did not become a replacement for on-street parking. Instead they became an addition to on-street parking. Princeton successfully made room for more cars- but added no extra space for pedestrians. Today, Palmer Square remains an enlarged traffic circle, with the central, grassy, park-like area cut off by an ever-flowing stream of cars prowling for on-street parking. Sidewalk cafes exist in Princeton- but none are on Palmer Square. But you can park your car there. What have been the benefits of planning for cars? In 1957, Charles Agle warned that there was a risk that the total number of cars passing through Princeton could exceed 20,000 vehicles per day. In 2013, more than 180,000 cars passed through Princeton per day. Have your say: would you like a pedestrianized Palmer Square? Can you remember the one-month-long car-free trial in May 1973? If you know more about this story, definitely let us know using the comments box below! This entry was posted in Complete Streets, Downtown Vibrancy, Events, People, Princeton, Smart Growth, The Parking Question, Traffic and tagged Palmer Square, Pedestrian, planning, Princeton. Bookmark the permalink. I think a pedestrianized Palmer Square is a great idea. The town could give it a trial pretty easily: Some places have road closures some days of the month eg one Saturday a month Palmer square could be a no-car zone. This would be a great way to start out. Unfortunately it wouldn’t allow all the benefits of permanent pedestrianization to be realized – cafes are unlikely to invest in outdoor tables if they only get to use them once a month- nevertheless I’d love to see it happen. Ahhh… but the CBD and Princeton itself could rent the tables and see how that would work. I mean what food service business would object to getting free seating to increase the capacity and sales of their business. They would be crazy not to! Come on Princeton. You are one of the greatest brain trusts on the planet! There is enough empirical evidnece out there showing that pedestrian plazas work time and time again. I think you can follow the research. Palmer Square is good but it could be GREAT!!!! Again a great story and great research! So is there currently a more “highly walkable” place in town than the Palmer Square vicinity ? The statistic “more than 180K cars per day passed through” would likely not stand up to scrutiny. If you visit the DVPRC’s “traffic counts” page for Princeton township, the numbers (traffic in *both* directions) only add up to around 120K via the portals. For example, Harrison (6K), Washington (15K), 206 North (20K), Route 27 (12K), Alexander (22K), Rosedale (9K) and so on. But it isn’t even possible to get a handle on the intersection of Princeton Pike and Quaker Rd this way: the AADT (annual average daily traffic) numbers don’t compute. Speaking of which, a computing-related trivia question: what’s the connection between Charles K. Agle and Oswald Veblen ? The answer is Jim Simons, the famous hedge fund manager and philanthropist. Simons once worked in cryptography (code breaking) for the Institute for Defence Analysis (IDA) located on campus in Von Neumann Hall, a building architected by Charles Agle. That was in the era of Vietnam war protests, a consideration among the borough officials and town planners when deciding whether Palmer Square could be enhanced as “a place for public gatherings”. After writing a protest-related letter to the NYT, Simons was fired from the IDA, which itself took refuge up on Bunn Drive. Then in 1976 Simons was awarded the Oswald Veblen Prize in Geometry. Anyway, you can ponder all this while walking or biking on the convenient off-road connector paths near Von Neumann Hall, en route to your protest rally. While he didn’t live to see it, Charles Agle got what he most advocated: a moat or permanent green belt of preserved open space. To clarify, the 180K daily car trips number comes from Ralph Widner’s exhaustive analysis of American Community Survey data. Ralph’s data comes from various sources, for example Journey-to-Work Census 2000. The statistic in question is on page 83-84 at the link below (caution: 86-page 11.3 MB download). It says “nearly 180,000 motor vehicle trips per day on our streets”. Say I own a car and commute to work, then when I get home at night I run an errand to/from CVS. So I make one trip at 8AM, another at 5PM, and a second round-trip at 9:15PM, for four trips total. Just me, in my one car. That is how Widner gets to 180K trips daily, unrelated to how many vehicles “pass through Princeton per day”. By contrast, a useful statistic I’d love to see: how many “rat runners” per day in this town. Whether it’s 120K trips per day or 180K trips per day, I think we can agree that it’s a lot of trips per day. Especially considering that 20K trips per day was considered extraordinary in the not-so-distant past. Fundamentally, the traffic that we have today is not innate, but something that we have planned and built for. We can choose how many cars we want in future based on what we plan and build today.